The 56-seat space provides students with hands-on training in financial services and business analytics across disciplines. An innovative lab in the Quinlan School of Business enables students across business disciplines to gain the hands-on, in-demand skills they need—and reinforces Quinlan’s position as a thought leader in Chicago’s business and academic communities. 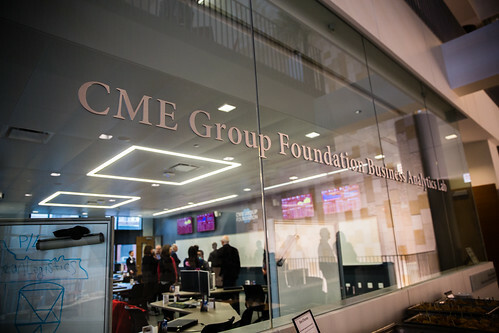 The CME Group Foundation Business Analytics Lab opened in fall 2015 in the Schreiber Center, Quinlan's new home, with the support of a $1 million gift from the foundation. The mission of the lab is three-fold: facilitate educational and research activities, while supplementing course work through experiential learning opportunities. The 56-seat space provides students with hands-on training in financial services and business analytics across sectors, including finance, marketing, healthcare, and supply chain management. Approximately 200 students use the lab each week; it is open 15 hours each day during the week and 10 hours on both Saturday and Sunday. Among other things, students are learning to analyze and interpret streaming data into actionable business insights. “With the advent of big data, students who are comfortable working with data and have a strong portfolio of how they’ve used data to derive the actionable insights have an impressive competitive advantage in the job market,” says lab director Fady Harfoush. Faculty are also benefiting from the lab’s diversified services by receiving hands-on training on industry software, which they then bring into the classroom. They are also using the lab to aid in gathering data for their own research projects. The lab features industry-leading financial services tools such as Bloomberg Terminals, Thomson Reuters Eikon, Morningstar Direct, and S&P Capital IQ platform. Live financial market indicators running in the lab help immerse students in the markets. The lab also offers in-depth user guides and access to top modeling tools and visualization software such as SAS, SPSS, Tableau, and RStudio. And through Quinlan’s partnership with Bloomberg for Education, students have the option to become Bloomberg Market Concepts certified. “Students who dedicate themselves to understanding the data, learning the software and go the extra mile to attain this certification are landing impressive full-time jobs and internships at leading companies in the industry such as JP Morgan, Wells Fargo, and William Blair,” says Harfoush. The lab’s flexible design fosters collaboration, creativity, and innovation among Quinlan students and faculty across all disciplines. Classes held in the lab include finance, information systems, business analytics, entrepreneurship and management, and marketing. The lab’s setup can be easily modified for various activities: From the tables to the chairs, everything in the lab is mobile and can be arranged for different configurations needed for effective teamwork and discussion. A series of white boards on wheels also support brainstorming and collaboration. View photos of the lab in the gallery below or on Quinlan’s Flickr page.